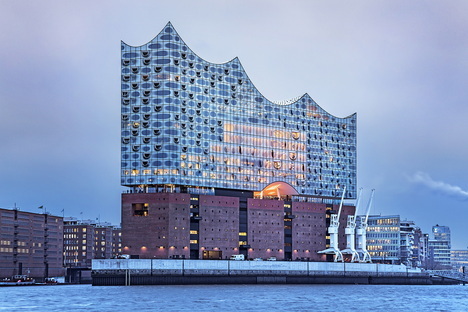 Herzog & De Meuron’s Elbphilharmonie, opened on January 11, 2017 after a lengthy and controversial construction process, is the new symbol of the city of Hamburg. 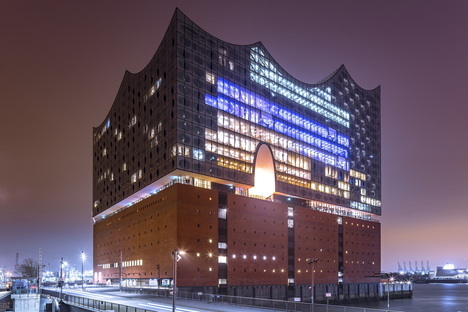 Standing in Sandtorhafen harbour, a Unesco World Heritage Site, the Elbphilharmonie contains three concert halls and a raised plaza with panoramic view of Hamburg. 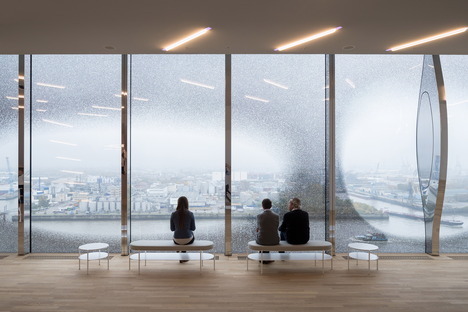 Hamburg has a new plaza, 37 metres above the city in the long-awaited Elbphilharmonie by Herzog & De Meuron. 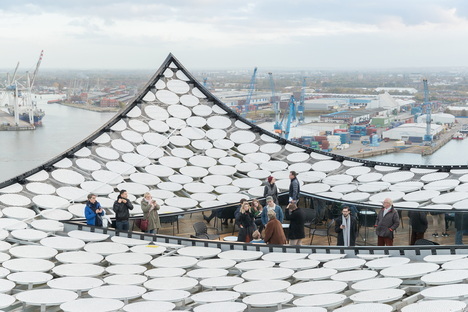 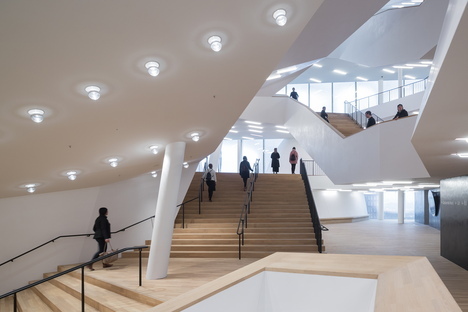 The project is highly controversial, both because work had been underway on Herzog & De Meuron’s project, inaugurated in January 2017, since 2003, and because of the cost to the municipality of Hamburg, which was well over budget, causing the work to be suspended in 2011. 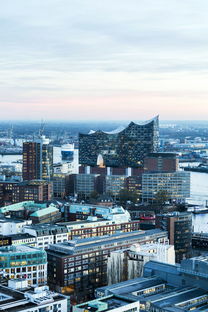 But it is also undeniably a landmark, making Hamburg one of Europe’s liveliest cities, with three concert halls in the centre of the complex plus a hotel, private apartments and, above all, a raised, covered public plaza measuring more than 4000 square metres, surrounded by a terrace with all-round views of Hamburg. 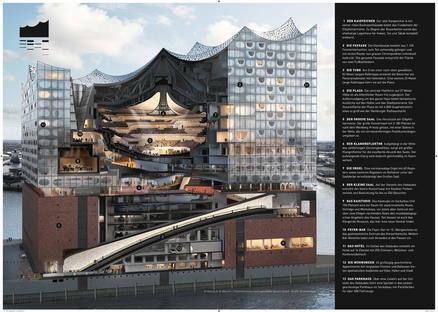 Herzog & De Meuron think of the Elbphilharmonie building as a bridge between the city’s past and its future, starting with its location in the Sandtorhafen harbour basin, and specifically on the site of the oldest warehouse in the Hamburg Docks, Kaiserspeicher A. 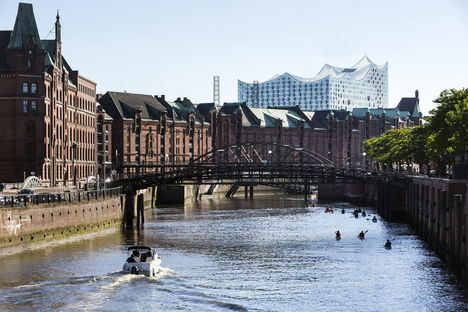 Which is in turn the heir to a history of great significance for the city: built in 1875, it soon came to symbolise Hamburg’s rise to a position of importance in international trade. 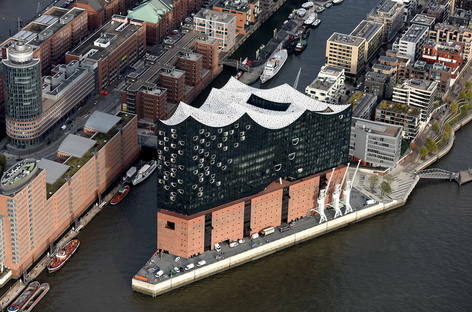 The second world war did not spare the neogothic building, and its ruins were demolished in 1963 so that the Kaiserspeicher A could be rebuilt three years later, still as a warehouse, with the appearance preserved today in the Elbphilharmonie. 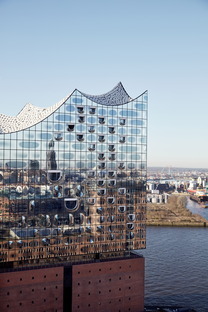 During construction of the philharmonic hall, the old warehouse was emptied out while preserving its brick perimeter walls and building a second, contrasting volume, completely covered in glass, on top of it. 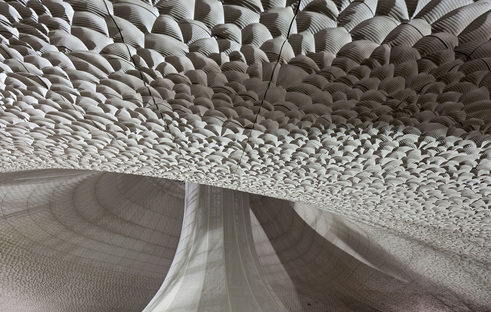 The curved panels form a tent-like roof with a startling suspended appearance, as if this whole portion of the building were wrapped in a soft, translucent surface like the curtain across a stage, about to be drawn back. Solidity and lightness, permanence and temporariness are the contrasting words that come to mind upon observing the dialogue-like nature of the architectural project, in which the old and the new come together in perfect continuity. 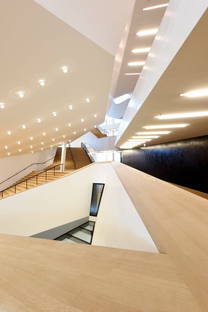 In actual fact this dichotomy between the two blocks of the building conceals what the architects call one of the most interesting structural challenges of our times, the uncoupling of the brick base from the volume above it, which contains one of the world’s largest auditoriums, to ensure perfect acoustic insulation. 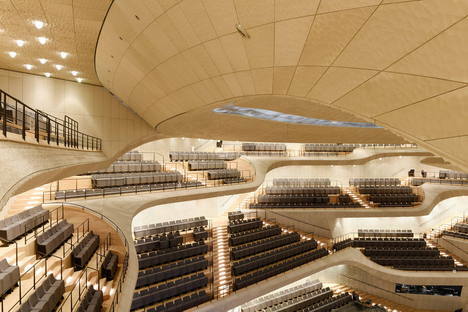 The concert hall is built in “vineyard style” (first used by Hans Scharoun in the Berlin Philharmonic), in which the seats of the audience surround the stage and rise step by step, like a terraced vineyard, with special acoustic insulation known as White Skin, developed specifically for the project by Yasuhisa Toyota. 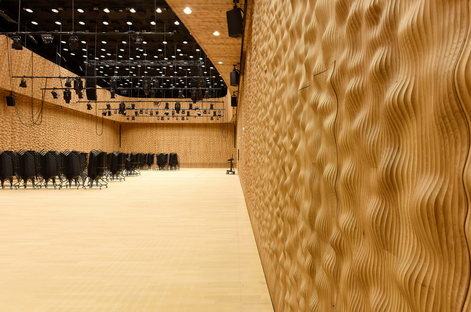 10,000 chalk fibre panels weighing 12,500 tonnes, milled in three dimensions on the basis of calculations aimed at obtaining an acoustically optimal surface, are each modelled and oriented differently and set side by side with such precision that they make the walls look as though they are covered with a single white coat. 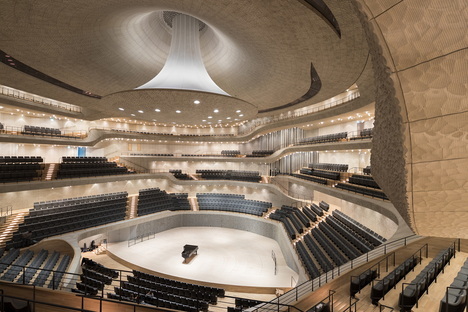 To support the total weight of the new philharmonic hall, about 200,000 tonnes, it was necessary to reinforce the 1111 concrete poles supporting the Kaispeicher A with an additional 650 poles to a depth of 15 metres in the Elbe River. 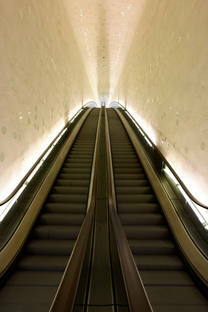 And with such impressive numbers, it will come as no surprise that the total cost of the work was 865 million euros.